Hi, everyone! Last week I slacked a little on posting due to school and work (story of my life for the next three months) However, I'm hoping to bring you all some good detailed posts this week! Today I wanted to share my updated skincare routine. If you're a regular reader or viewer of my blog and channel then you probably know I have dry skin year round. Currently, it's at its driest. 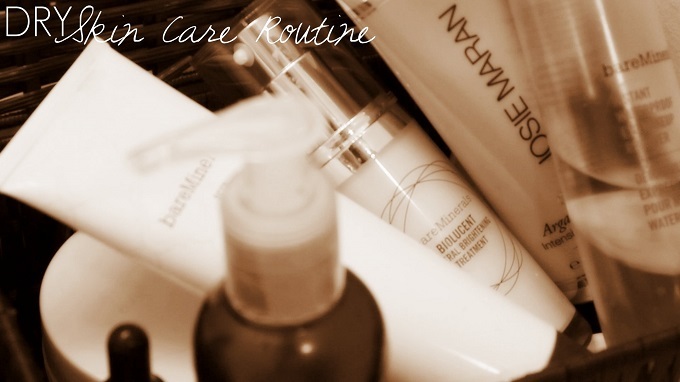 Luckily, I've found some awesome products that help combat the dry areas on my skin. This routine won't be for everyone due to the amount of oils and moisturizers used. However, when used in moderation, I think anyone can use these products. Enjoy! 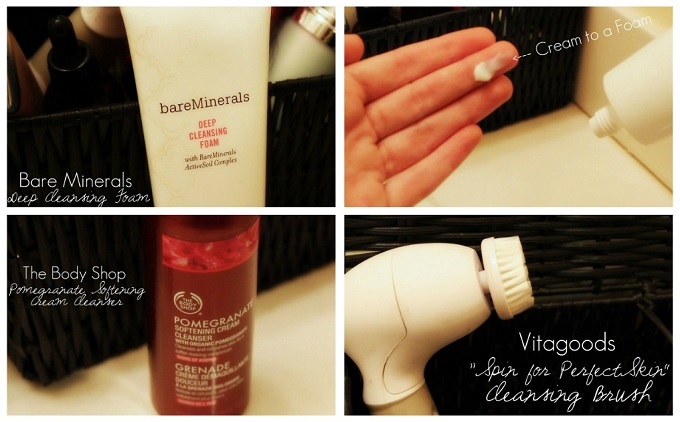 Bare Minerals "Deep Cleansing Foam" - I've always heard it's best to use a cream cleanser on dry skin. The past couple years, I've found this to be true. My all time favorite is the Deep Cleansing Foam by BM. It lathers into such a rich foam, I almost feel as if it's moisturizing while cleansing. The scent is mild and it always leaves my face feeling fresh. The Body Shop "Pomegranate Softening Cream Cleanser"- This is a new discovery for me. I wanted a slightly cheaper cleanser to use for quick cleansing and stumbled upon this one day while browsing The Body Shop's sale. I have to admit, I'm not crazy about the scent but it does do a great job of leaving your skin feeling soft after cleansing. I HATE the feeling of tight skin after washing my makeup off, this cleanser doesn't do that! Vitagoods "Spin for Perfect Skin" Cleansing Brush - Using a cleansing brush has seriously changed my whole skin care routine. It's amazing what you're hands leave behind on your face. The Spin for Perfect Skin Brush is great because it comes with 3 different attachments. A gentle face brush, pumice stone, and body brush. The Gentle Face Brush is heavenly. I've seen a difference in the appearance of my pores just by using a cleansing brush! If you're interested in the "Spin for Perfect Skin" Set, I have a 60% off coupon when you use code "LoveShelbey813" at checkout! Tarte Maracuja C-Brightener Eye Cream - I've been using this eye cream since Christmas and I've really been enjoying it. I'm a big fan of the Maracuja line from Tarte, so this eye cream has yet to disappoint! It's definitely a thicker texture (which I like) and provides intense hydration. Bare Minerals "Instant Waterproof Eye Makeup Remover" - It seems silly to pay a lot for eye makeup remover, I know. However, it's also a hassle when you spend 20 minutes at the sink tugging at your eyes to get your liner, mascara, and shadow off with a cheap remover. I'm going to be honest, I will pay good money for a great eye makeup remover and I haven't found one quite like the Bare Minerals Instant Waterproof Eye Makeup Remover. It has a very oily texture (which, in my opinion is the only way to get your eye makeup off) that breaks down the product immediately and makes for a quick take-off! The best in my opinion! Josie Maran "Argan Infinity Intensive Creamy Oil"- I swear, this product was God sent for scaly alligator skin like mine! The Intensive Cream was designed to be an all purpose hydrating product - meaning you can use it anywhere (face, lips, body, hands etc.) For me, it's such a great product to use on the driest of areas on my face. I literally haven't had any flaking since I've started using this. Plus, it smells like oranges! This will be a product I continue to use for years to come! Josie Maran "100% Argan Oil"- This is a product I've been using on and off for about a year now and I have to admit a facial oil has replaced my standard face cream! An oil won't be ideal for every skin type but for normal to dry skin, it's a dream. Josie also has a "light" version of this oil which is great for more combo/oily skin types! It's a great boost of hydration! Dermalogica "Daily Microfoliant" - I've never found an actual exfoliating product I enjoy up until now. The store I work at is a retailer of Dermalogica and I recently picked up a trial kit with the Daily Microfoliant in it....OMG, amazeballs! It's a powder exfoliant which you activate with water. Now, I've used Bare Minerals powder cexfoliant before and wasn't impressed, so I was a little nervous to try this one out. Luckily, the Microfoliant turned out to be awesome. Even though it's an exfoliator, it manages to lather up and provide moisture while exfoliating. It's pretty much the bees knees! Bare Minerals "Biolucent Mineral Brightening Treatment" - You guys may have seen my "first impressions" post over this product. I've since been using it for about a month and I've really been enjoying it. It's hard to put this product into one category because it does a little bit of everything. The treatment is supposed to brighten skin, reduce the appearance of dark spots, and gently exfoliate with natural citrus acids. 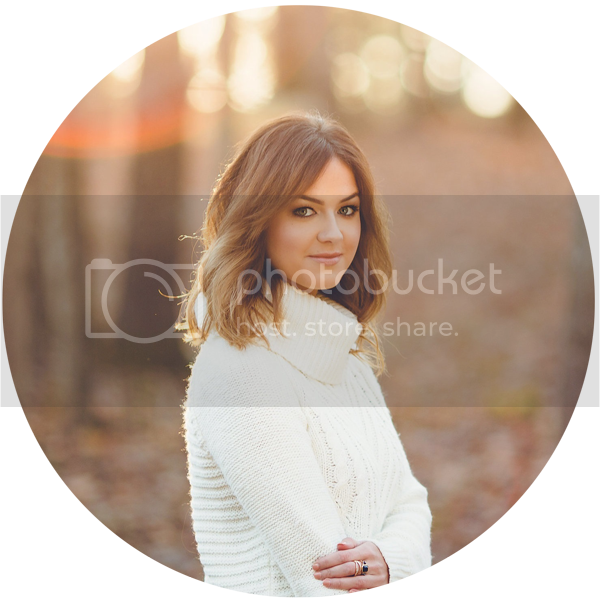 Overall, I've noticed my skin to be softer and a little more evened out! 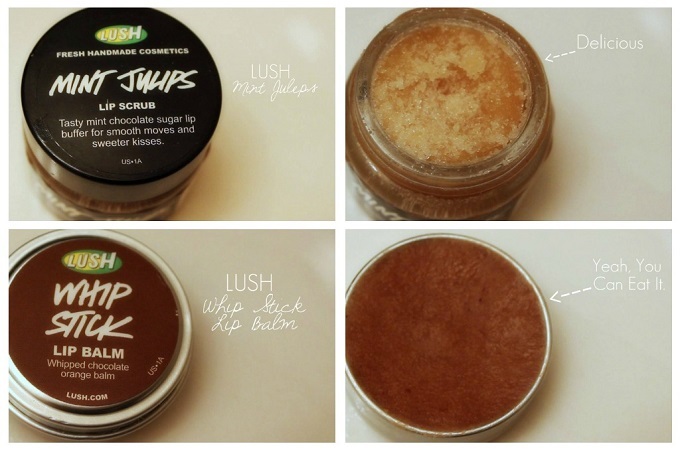 LUSH Cosmetics "Mint Julips" Lip Scrub - Of course, you can't forget the lips! From the moment I saw the Lush "Mint Julips" Lip Scrub, I knew I had to have it! It scrubs all of the dead skin cells off my lips, leaving them perfectly polished. Oh, and it tastes like a dream! LUSH Cosmetics "Whip Stick" Lip Balm - This is probably the most unusual lip balm I've ever owned. It has a bit of a thick consistency but moisturizes my lips FOR EVER! The smell is amazeballs, I can't get over how good it tastes and have to admit that sometimes I have to reapply it because I lick it all off haha! I hope you all found some new ideas for your skincare routine in this post. I tried not to be too overwhelming but I'm a big skin care buff so I'm always trying new things! Thanks for posting! I think maybe I'll try that Dermalogica brand out, I was eyeing it in the store the other day! This was great to read! I have dry skin myself so I feel you! I am so gonna have to get some of that pomegranate stuff from the body shop. Too good to pass up! I used to spend TONS on eye makeup remover. BUT I have a new go to. Maybelline Clean Express Waterproof Eye Makeup Remover! It's only $6 and is a GODSEND! Cannot recommend it highly enough. Takes my makeup right off and lasts a really long time.